I am obsessed with this whole outfit! These shoes are my new favorite shoes, and they are from Kmart.. What?? I love them so much I got them in black too. They are so comfortable and SO cute. 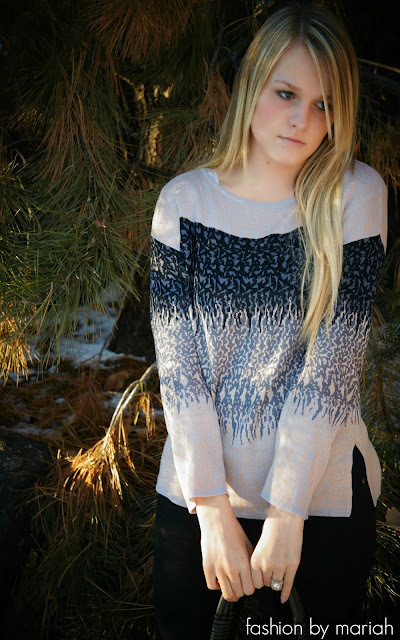 And this sweater, it is so perfect and you can tell just by looking at it that it is a high end top! I also love the pattern it is so unique, I even got it in a cardigan and I can't wait to style it. Stay tuned! Notice my cute new purse that I got for Christmas from my husband, it is so cute and I am sure you will be seeing it a lot! Also, Gypsy 05 is offering 15% off to all my readers! Just use the code 'FASHIONBYMARIAH' at check out to get 15% off! Thank you for stopping by end enjoy your Holiday weekend! !